WHY IS PSE CHANGE IMPORTANT? Health outcomes are the result of a complex combination of factors including not only biological or genetic causes but also race, ethnicity, gender, sexual orientation, socioeconomic status, education level, mental health, geography, etc. (U.S. Surgeon General, n.d.). 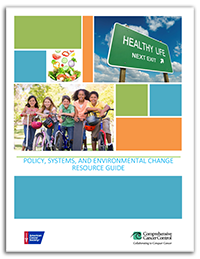 Health problems are influenced by policies, systems and environments (PSE) that make it easier to sustain unhealthy behaviors than to foster healthier choices. Individual lifestyle choices are only one part of our ability to live healthy, productive lives. A mix of social, economic and physical factors drives health disparities, or “differences in the incidence (new cases), prevalence (all cases), mortality (death), and burden of diseases and other adverse health conditions that exist among specific population groups” (National Institutes of Health, 2002). Despite progress in cancer prevention, screening and treatment, a disproportionate share of uninsured, medically underserved and minority populations across the United States are impacted by cancer (American Cancer Society, 2009). Health disparities are nearly impossible to address without a multi-level, ecological or PSE change approach that considers the opportunities and challenges facing all people in the community. The PSE change approach includes and addresses these types of recommendations. 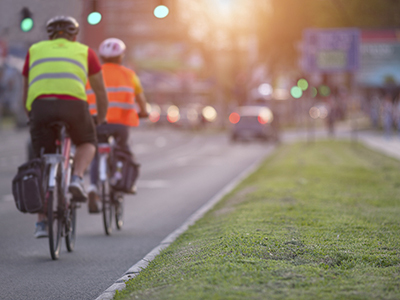 By adjusting the policies, systems and environments that impact our daily lives, we can create settings that allow for sustainable, healthy behaviors. PSE change facilitates embedding healthy options in the fabric of our society. Chart adapted from Food Trust (2012). The overall process of PSE change can be broken down into seven general steps. Below is a summary of each step. While a comprehensive PSE change strategy will include each of the steps, some efforts may not need to follow the full process for every initiative. The seven steps each have their own page that describes how to use data at that stage of the process and lists step-specific tools and resources. Each step also includes a downloadable worksheet with questions to consider in planning and implementing activities for that step. These worksheets can be used to facilitate coalition training and planning discussions. Build partnerships with community stakeholders and engage partners affected by the broad issue identified. Ensure that the partnership includes stakeholders who can effectively implement or support evidence-based cancer control PSE change interventions. Do your homework. Conduct an environmental scan to determine which actions should be taken. The environmental scan helps identify gaps, trends and external factors affecting the political, social and economic context and determine the appropriate actions for potential PSE change. Perform a thorough review and assessment of all available data to determine which specific aspect of the broader health issue can be potentially resolved or lessened through PSE change. Review project feasibility to determine if it can be done. Work with stakeholders to develop a strategy for turning an idea, goal or objective into action, including a discussion of the political climate and readiness. Ensure that key champions are involved to provide support. Communicate to all stakeholders the need for the PSE change prior to implementation to help lessen potential resistance. Incorporate various forms of media to educate and build support from stakeholders and the public, when appropriate. Carry out PSE change activities that link directly with goals and objectives in your cancer control plan. Measure the processes and outcomes attributed to the PSE change intervention. The evaluation should provide quantitative (numeric) and qualitative (narrative) data to capture coalition activities and determine the change(s) that occurred as a result of the PSE change effort, including changes in knowledge, attitudes, beliefs and/or behaviors that can be credited to its implementation. This no-cost training explores PSE change, from its evidence base to a full-length case study. 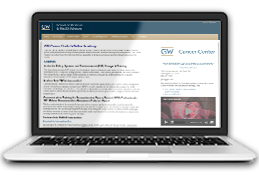 It provides background information on the 7-step PSE change process, stepwise worksheets, a PSE action plan template, real world examples from comprehensive cancer control (CCC) programs, an extensive resource list, and theoretical and evaluation approaches to help grow the PSE change evidence base. This guide is the result of several years of collaboration between the Comprehensive Cancer Control National Partnership and select CCC Program PSE demonstration projects. Relevant sections of the guide are linked at each step of the PSE change process to provide further reading and handy tools.